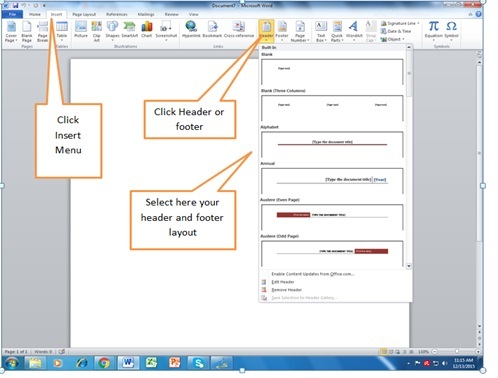 Open your Microsoft Word application. Once it open, click insert menu at the top of your screen. Under the ribbon menus, find the menu called header and footer. Then select/click the header button. Click the down arrow to pick a date, and type your title of any in the right side. Design you text as you can example, apply bold and italic and font style and size. Now scroll down for the application of the footer. Now inside the broken like at the bottom of your document, click on it. Once you see the cursor blinking inside, type a line of sentence or any important text, such as email add, tel. no., your address, etc. 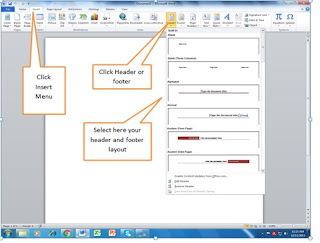 Above the text apply borders, or use the menu above for footer, click insert menu. Then select a pre-design footer, example annual. If you want some layout, formats, and insertion, you can click either design, layout, design under the table tools and header and footer tools menu. This menu are hidden menu, so need to open your header and footers by double clicking it. That’s all see you in next post.